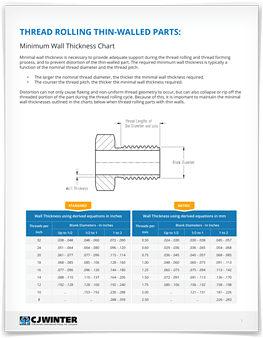 Use our Minimum Wall Thickness Chart when thread rolling thin-walled parts. Minimum wall thickness is typically a function of the nominal thread diameter and the thread pitch. Any distortion can not only cause flaking and non-uniform geometry — but can also collapse and damage the part during thread rolling. Use the form at the right to download and print a copy of this chart for your records.